Siamak Hariri, principal of HPA, speaks about his company’s vision for Harmony Village. Last Wednesday, we sat in on the tail end of the unveiling of architectural submissions for City Core Developments‘ Harmony Village Lake Simcoe. This unprecedented Barrie waterfront resort village is attracting attention due to its emphasis on architectural sophistication, luxury resort amenities and sustainable building strategies. Four big name architects gathered in a seminar room at the Art Gallery of Ontario to show off their submissions to a panel of high profile jurists that included architecture critics from Ryerson University, the Toronto Star, the Globe and Mail and Vanity Fair as well as Ian Chodicoff, the editor of Canadian Architect. The architects in question? Core Architects, Diamond Schmitt, Hariri Pontarini and RAW Design. Yes, these are some major players in the Canadian (and especially Toronto) architecture scene and one of them will be bringing an amazing new urban village design to Barrie. The Harmony Village site is located on prime Lake Simcoe waterfront and will incorporate a mix of shops, boutiques, restaurants and an array of year-round activities. The development will feature must-have health and wellness amenities (yoga and pilates anyone?) as well as a great mix of educational and social outlets like sailing, art classes, wine tastings and more. Sounds good, right? The real kicker to this project is the the amount of input the public will have in the design process. Jack Pong, President of City Core, is set on the overall design and master plan being a reaction to public demand instead of the other way around. 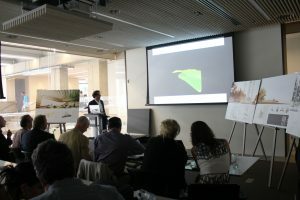 Last Wednesday’s architecture unveiling kicked off the public voting process. The voting will continue through the first half of September and a temporary discovery centre will be open on-site in Barrie. Voting will take place on-site and the design concept will be announced in mid-September at a cocktail reception. For more info visit harmonyvillage.ca.